I had the huge pleasure last night to join two talented Cowaramup artists, painter Kerry Sibly and sculptor Alan Meyburgh, at the launch of Kerry and Alan’s exhibition for this year’s Open Studios. One of Alan Meyburgh’s sculptural creations. This looked amazing lit up at night. About 80 people came along to the launch, held at Kerry and Wendy Sibly’s house. The house itself made an amazing frame for an art exhibition. At different times Kerry and Wendy’s home has been in the lens of programs such as ‘Grand Design’; and on the radars of some of Australia’s house and lifestyle magazines. It’s an incredibly special place, filled with personal traits, tricks and treats. Kerry and Alan made a combined sculpture that they offered as a prize on their launch night. Alan sculpted the heart, and Kerry (in his words) “added the rusty barbed wire to it”. Kerry Sibly stood on the kitchen bench to make his speech at the launch. He’s holding the sculpture he and Alan put together as a prize for launch night. Alan is pictured in the centre bottom of the screen, and the lovely lady in the background is Wendy Sibly, Kerry’s better half. PHOTO: Emily Cockburn. We were thrilled to have the sponsorship of Stella Bella Wines and the Margaret River Dairy Company for our launch. There’s nothing like viewing art, sculpture, and books whilst enjoying classic Margaret River wine and cheese! A sample of Kerry’s artwork above Alan’s sculptures. The Margaret River Region Open Studios (MRROS) is now in its fourth year, involving artists of all pursuits from Busselton to Augusta who open their studio/shop/shed or workplace to visitors where people can peruse and buy artworks, but also talk to the artist and see them at work. People are laughing… so Kerry’s speech must have been funny. PHOTO: Emily Cockburn. If you are in or around the Margaret River region, please look for the Open Studio signs everywhere, or visit www.mrros.com.au to see what’s on offer. Kerry and Alan’s exhibition is No. 51 in the Guide. They’re open every day from 10am to 4pm, including ANZAC day. 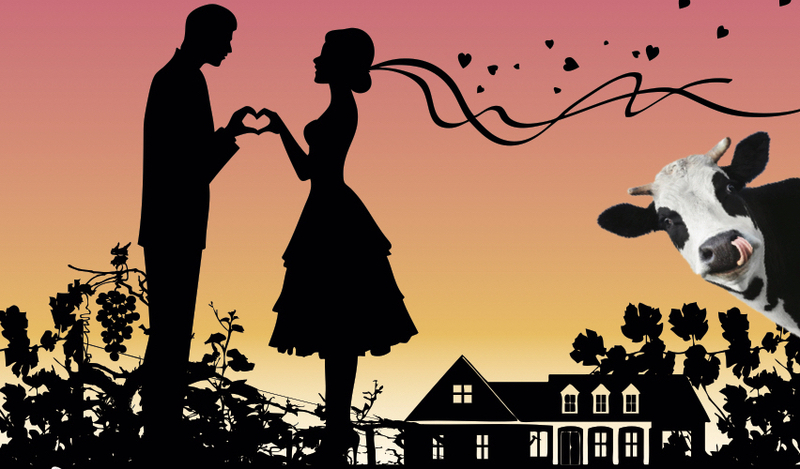 Cover Reveal: Who Killed The Bride? I am so excited to give my blog readers the first exclusive look at the brand new (and so very beautiful) print cover for my new Butterfly House series. I absolutely love this cover, Kerry Sibly, and I am so looking forward to future Butterfly House adventures with you and Wendy, and Mukau. 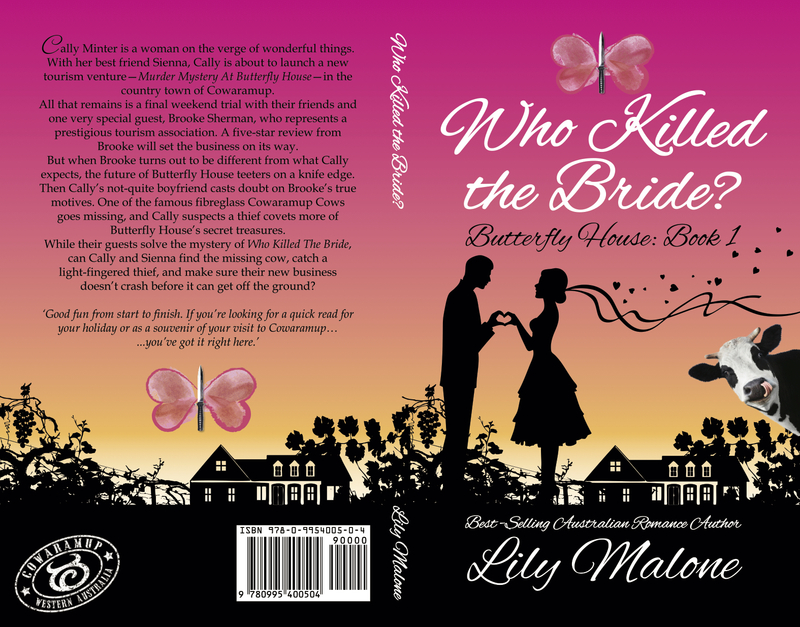 Posted on September 22, 2016 October 18, 2016 Categories Marketing and promotionTags Butterfly House, Kerry Sibly, Lily Malone, Mukau Gallery and Giftware, Who Killed The Bride4 Comments on Cover Reveal: Who Killed The Bride? I have a new book project… as always seems to happen, it feels like it has taken forever to write, but all of a sudden I have the most amazing cover, and I’m signing off on printing plans, and I have a launch date and publishing deadline, and everything is happening at warp speed! It’s called Butterfly House and its a real change of pace for me. First – it’s a series – which I’ve never done before and second it’s kind of chick-lit, not romance. It’s a seriously local story, set in an imaginary location in my home town of Cowaramup. If you’ve ever visited Cowaramup it’s that little dot on the map snuggled in the middle of far more famous cousins such as Margaret River, Busselton and Dunsborough… and for years and years if you blinked driving through on the Bussell Highway, you missed it. These days, Cowaramup is famous for its herd of life-size fibreglass cows that munch imaginary daisies on our main street, chew their cud, a-low and a-moo and lie or stand around doing their thang day in, day out. (Here are some photos of WA romance authors Jennie Jones and Juanita Kees checking out the cows during a visit with me in 2014). Jennie Jones & Juanita Kees with the cows during a visit to Cowaramup in 2014. Juanita gets cosy with a calf. Not everyone loves the Cowaramup cows, but most people do, and I’m one of the latter. The cows have been wonderful for retail businesses who might otherwise have had to close their shop doors as our town got bypassed for the bigger, more touristy places. Now people have a reason to stop, take photos, and enjoy so much of the community spirit that makes Cowtown, such a cool town. In the first of the Butterfly House books, Who Killed The Bride, we meet Cally Minter and her best friend, Sienna Devereux, just as they are about to launch their new business: Murder Mystery at Butterfly House. Do you remember those old fashioned murder mysteries that were a ‘thing’ about 20 years ago? I wrote one once (incidentally). It featured Brad Pitt, Jennifer Aniston, Sylvester Stallone, Russell Crowe, Tom Cruise, Penelope Cruz, Angelina Jolie and Jack Nicholson. (Hubby played Jack). I wrote scripts for everyone and the game ran on the clock. People had to be some place at a certain time and say something to another character. Or some other character might see them leaving the garden, or the shed, or the house (with a dripping bloody dagger in their hand) kind of thing. In the game I wrote years ago, ‘Tom Cruise’ was found dead in the front yard of our garden in Hahndorf… and it turned out Angelina and Russell were the dastardly pair who combined to knock him off. (Russell was jealous because he’d missed out on the lead in The Last Samurai, which Tom went on to get…). We played the game and ate, drank and made very merry… we had a blast. Butterfly House kind of takes off, where that fledgling idea began. I can’t wait to show you the AMAZING full cover for Who Killed The Bride? Butterfly House: Book 1. It was designed by local artist (incidentally – he doubles as ‘vet’ to the Cowtown cows) Kerry Sibly who runs the gift shop Mukau in Cowaramup main street. This man is a genius!